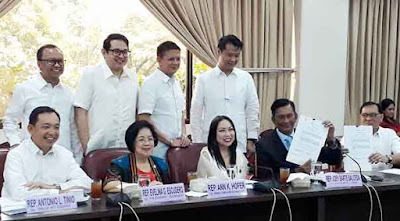 LEGAZPI CITY, May 30, 2017 – Rep. Joey Sarte Salceda of the Albay 2nd Congressional District told media that the consolidated bill on Universal Access to Tertiary Education wa signed by the members of the Bicameral Conference Committee in their session held Monday. Salceda said that the bill if formally signed by Pres. Rodrigo Duterte into law will provide free tuition and miscellaneous fees to State Universities and Colleges (SUC’s) or government run universities an colleges like the Bicol University. The proposed law also covers the Technical Vocational Schools run by TESDA nationwide. He added that under the bill, the government will pay for the tuition fees of students enroled in all Community Colleges nationwide. A subsidy will also be available and loan to student college students in private schools. Low income or indigent to middle class will be the priority for such benefits. Salceda added, that students in private schools included in the top 10% rich were excluded to subsidy and loan.